Edit: and yet here's an article at Life-Site which cites an Austrian Bishop, Laun of Salzburg, who cites Pope Francis as being opposed to the gender ideology. 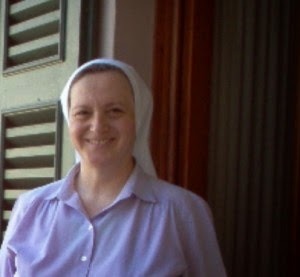 (Rome) The Prefect of the Congregation of Religious, Cardinal João Braz de Aviz, appointed last May 19 has assigned Dorothean Sister Fernanda Barbiero as the Apostolic Visitator for the Franciscan Sisters of the Immaculate Conception (for visitation see Salus animarum suprema lex - Will he Smashing of the Franciscan Sisters of the Immaculate Conception Begin Now Too? ). The male branch of this religious community has been under provisional administration since July 2013. "Commissioner" Fernanda Barbiero comes from the same cultural milieu as Marinella Perroni, who teaches New Testament at the Benedictine College, Saint Anselm in Rome. Barbiero and Perroni are members of Coordinamento Theologe Italiane (Italian Coordination Centre Theologians, CTI). Perroni is even one of the founders and has led it for years as president. Barbiero and Perroni are "convinced feminists," as an article in the Journal of pastoral issues "Vita Pastorale" states. First pioneer of the "Christian Socialism," then the "Gender Theology"
In the article Perroni referred approvingly the struggle of Christians "for Christian Roots" only "as a rearguard action" and a "backward-looking strategy." 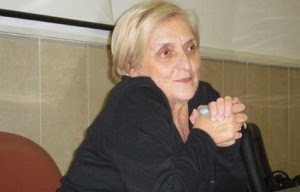 Perroni is a staunch advocate of a "pluralistic world" and the "Conciliar Church". In the 70s the theologian dreamt of a new catechetical "faith-literacy course", which was developed as a literacy model in Brazil by Paulo Freire and his "Pedagogy of the Oppressed". Who was Paulo Freire? The educationalist Freire referred to himself as a "Christian Socialist", who took the ideas of Marxist "liberation theology" as his own and created a syncretic form of Christianity and Gramsci-Marxism. That was the model on which to Marinella Perroni thought the new catechesis should be based. Perroni was ecumenically stamped by Taizé, in the 80's she was a pioneer of gender theory. She promoted gender as an "interpretive key for historical analysis." This brought her a tribute from the feminist online journal inGenere as "one of the most important representatives of the gender-theology '." 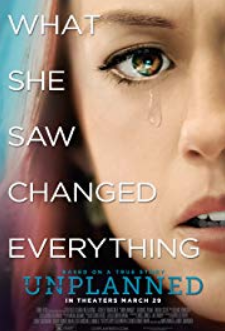 Gender Theory "The Big Change" - Abortion as "Women's Rights"
It's about the same gender theory that after the Fourth World Conference on Women in 1995 experienced a politico-ideological triumph in Beijing, at the UN conference, where Sister Barbiero was hailed as "the big change". It is therefore no coincidence that Marinella Perroni showed little sympathy for Pope Benedict XVI.. .The German pope had, according to the theologian, been "guilty" of "intervening forcefully against the gender theory" and to have "called homosexuals as enemies of peace." Perroni was part of the governing body of the Women's Initiative SNOQ begun in 2011 that arose as a left protest movement against the then Italian Prime Minister Silvio Berlusconi, who was accused of "sexism". SNOQ defends the legal killing of unborn children as "women's rights". It was no problem for the gender theologian Perroni. Masonic provocation: Symbiosis of Church and Lodge in the Character of "Human Rights"
A few days ago Perroni appeared in the company of other great "prophets" of the Conciliar Church, with Alberto Melloni, the undisputed head of the "School of Bologna." Both were speakers at a meeting of the Masonic Grand Orient of Italy (GOI) about the "Secret Council" (see the report of the secret council - Second Vatican and Freemasonry ). 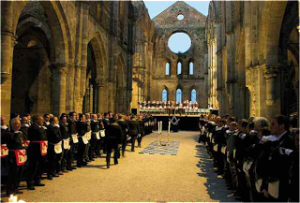 Grandmaster Stefano Bisi went so far as to describe the character of the "encounter and dialogue," as a fusion of the Catholic Church and Freemasonry in the name of encouraging "human rights and freedoms". Corrispondenza Romana writes: "It is the eternal temptation that always returns, this time in the form of an open provocation". Grandmaster Stefano Bisi said at the meeting: "I would be really glad to know what Pope Francis thinks of Freemasonry" and he invoked the same, by no means a random date, for which the Grand Master of the Grand Orient would want a papal signal, the anniversary of the 1870 breach in the Porta Pia which defeated the Roman city walls, representing the end of the Papal States and is commemorated by the Freemasons every year as a holiday. "The next September 20th is to be celebrated because of another breach, a breach that is being used to break down walls that separate the different worlds, who would like to meet. There is a great need for connections. That was also the message of the Second Vatican Council," said the Grand Master. "You can not accuse the Grand Master not to have spoken clearly," said Corrispondenza Romana . "The extreme clarity is in the message that's sent out with the meeting and published on the website of the Grand Orient." It says of the Second Vatican Council: This leap "forward of the Church into the modern society appeals to Freemasonry, today as then, which is renewed today, just as it did during those contentious years, following with interest the changes that are emerging across the Tiber [in the Vatican]. "Vatican II" presented a unique time of dialogue without a doubt and mutual understanding, which fall at this stage appears to have begun a new Conciliar era, where everybody has opportunities to link back to it." Grandmaster Bisi and the Grand Orient are pulling out all the stops to make Pope Francis and the "Church of Vatican II" its palace. Franciscan Sisters of the Immaculate Delivered to Gender Theologian? Deprived of Franciscan Sisters of the Immaculate Conception of the Old Rite and the Order line: religious congregation leads to a bull in a china shop. Given these facts, there is the question of what exactly Marinella Perroni was referring when she recently said in an interview that "big news is possible today, but it needs a serious director" in the Church? The fact is that the cultural humus on which Perroni and the new "Commissioner" of the Franciscan Sisters of the Immaculate thrive, "is a whole different story,has completely different roots, very different charisms and very different objectives," than the traditional Franciscan Sisters of the Immaculate Conception, who have already been robbed of the Old Mass and which some now want to inflict a "realignment" upon them in the sense of re-education. The gender theologians have a markedly ideological flip side, the face which presents a reality as different as the Franciscan Sisters of the Immaculate Conceptioncan can only produce misunderstanding and suffering. 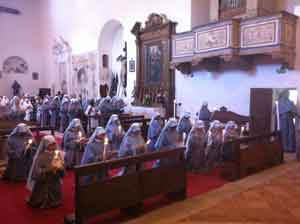 The Franciscan Sisters of the Immaculate Conception with its ​​missionary and contemplative branch are bound by the traditional Rite, Catholic tradition, and not least also the inalienable right to life of unborn children. The responsibility for this lies with the Congregation of Religious that is handing on "pastoral custody" with the subtlety of an elephant in a china shop on its behalf and is definitely positioned on a particular side. This is a horror movie. Brainwashing religious 'clean' of thier Faith and right thinking. It is clear to any faithful Catholic -who- has to die now. It is clear that this is the only solution, and I doubt it is murder, for it is indeed an act of righteousness to destroy these agents of Satan. Remember that even these powerful and influential people have to eat and sleep. They must be removed or taught to fear God- for the only reason they have no fear of God is because they have not been punished enough. May the Immaculate Virgin PLEASE step in to protect her holy daughters! The Catholic Church is under a siege perhaps like never before with masons and sodomites infiltrating to the highest levels. How long, O Lord? Sister Fernanda Barbiero overseeing the Franciscan Sisters of the Immaculate and Marinella Perroni, who teaches New Testament at the Benedictine College, Saint Anselm in Rome like the Freemasons,interpret Vatican Council II as saying there are exceptions to the dogma extra ecclesiam nulla salus.So they irrationally imply that there are visible cases in 2014, exceptions to the traditional teaching on salvation. This was the Freemason victory in the Boston Case when Cardinal Cushing inferred that there were known exceptions to the traditional interpretation of Fr.Leonard Feeney.This same false inference is being made in Vatican Council II even though the text does not state this. This point is the weakness of the Left. Once the distinction between INVISIBLE and VISIBLE salvation is made, there is no text in Vatican Council II , with which Barbiero, Perroni or any one else, can cite, to claim that Vatican Council II is a break with traditional teaching.This is important for the Franciscans of the Immaculate.It means the Vatican Council II which they have to accept, is traditional, without a false inference. They can say YES to a Vatican Council II ( without the visible-dead premise which are exceptions to extra ecclesiam nulla salus). Here is the Dean of Theology at the Benedictine College,Saint Anselm in Rome contradicting Marinella Perroni. Perhaps Marinella is also in ignorance and once she is aware of the objective error she would agree the Benedictine priest-professor of theology. He is saying that Nostra Aetate is not an exception to extra ecclesiam nulla salus. He is saying that the baptism of desire ( implicit for us) is not an exception to extra ecclesiam nulla salus. This was not part of the formation of the Franciscans of the Immaculate. For you there are exceptions to the dogma on salvation.So you infer that there are VISIBLE cases on earth.Otherwise how could there be exceptions? The worst thing about the truly diabolical persecution and tyrannical re-education regimes - is the utter silence of those who are leaders in the Church, those who apparently adhere to the Doctrine of the Faith. There is no one in position of leadership or with a wide public platform denouncing these most egregious and vicious and flagrant, pointed deadly attacks. War has been openly declared and offensive well established - and yet, there is no resistance from those with the duty and means to do so. Blessed Michael, Archangel defend us in battle . . . While all you say is true, do we really NEED them to speak up? Oh heck no! These religious are Catholic enough to know that you do nit obey heretics, apostates or other phony Catholics. I would remove my habit and become a hermit before I would dance with these jackals. Yet, the Good Lord has seen to provie for them. They do have a place to go where they can live out their vocations as faithful Catholics. A place bursting at the seems with ripe harvest and they are sorely needed. So what the @*#% are they waiting for?! Enough of these Roman frauds already! If they are that intent on going to Hell let them be quick about it but do not let their buses be filled with those who should know better. BTW, Lynda, I do enjoy the comments you post. I am always glad to see your name! Shed some light...yo brains is bread. Brains is made of bran-flake muffin. Ups you hopped ran like a deer. And jumped right in wolf-sheepy's stew. And one by one them froggies died. Then wolfy-sheep he called, "My sons?" Tomorrow bring yo sistas dea'." 'Cause litto frog him do obey. Tumbled, tripped into Frog Pop. And froggy Pop asked, "What you say?" "The most resplendent manifestation of God’s glory is the salvation of souls, whom Christ redeemed by shedding his blood. To work for the salvation and sanctification of as many souls as possible, therefore, is the preeminent purpose of the apostolic life... God, who is all-knowing and all-wise, knows best what we should do to increase his glory. Through his representatives on earth he continually reveals his will to us; thus it is obedience and obedience alone that is the sure sign to us of the divine will. A superior may, it is true, make a mistake; but it is impossible for us to be mistaken in obeying a superior’s command. The only exception to this rule is the case of a superior commanding something that in even the slightest way would contravene God’s law. Such a superior would not be conveying God’s will... Obedience raises us beyond the limits of our littleness and puts us in harmony with God’s will. In boundless wisdom and care, his will guides us to act rightly. Holding fast to that will, which no creature can thwart, we are filled with unsurpassable strength. Obedience is the one and the only way of wisdom and prudence for us to offer glory to God. If there were another, Christ would certainly have shown it to us by word and example. Scripture, however, summed up his entire life at Nazareth in the words: He was subject to them; Scripture set obedience as the theme of the rest of his life, repeatedly declaring that he came into the world to do his Father’s will. Let us love our loving Father with all our hearts. Let our obedience increase that love, above all when it requires us to surrender our own will." If the 5 dissenting friars had been obedient, this would not have happened. But as it is, all the FFI and FSI and the lay associates have the opportunity to suffer greatly, and they are, because heaven needs their sacrifice. Forced re education sounds like communism,they'll have a lot of re education to do on the the New Age religious,they need to be taught the Catholic Faith as opposed to Buddhism ,Hindi ,and everything else their practising . Obedience to a a lawful superior is good only if the relevant direction is not in conflict with the Doctrine of the Faith, the Natural Law, natural justice - the truth, and thereby threatenIng the salvation of souls. There exists objective evil and we have a moral duty (under Divine Law, Natural Law, the higher law as recognised by the Church) not to cooperate with of acquiesce in evil wherever it comes from. Lawful authorities do not have absolute authority - the authority is delimited by the Deposit of Faith and morals. Here are links to good Catholics who will not say that the SSPX and the Letter of the Holy Office made an objective mistake.Perhaps, this is due to some form of obedience. They will not answer questions which show that the cardinal who issued the Letter of the Holy Office had assumed there were EXCEPTIONS, to the interpretation of Fr.Leonard Feeney. If there were exceptions for him, then he was implying that he could see the dead-saved with implicit desire or in invincible ignorance. Numerous Catholics out of obedience repeat the same irrationality. Do we have an agent provocateur in our midst? Ugh. Nobody should be talking about killing anyone. There is more information coming out of Italy on what the commissar-ina is doing to the holy Sisters. Its bad. It seems the Vatican and the Congregation that sent a modern feminist 'nun' from an Order no one has heard from (probably dying out) that she is the sort of feminazi desired in 'nuns'. No more those sweet sisters of prayer and penance! No, lets modernize them like 'nuns' on the bus or the rest of the LCWR or the deathscort 'nuns' at an abortion mill. Heresy will get you dialogue and a looking the other way while your Order withers and dies but faithfulness----sooner or later the modernists will come gunning for you. Demonic at the core.